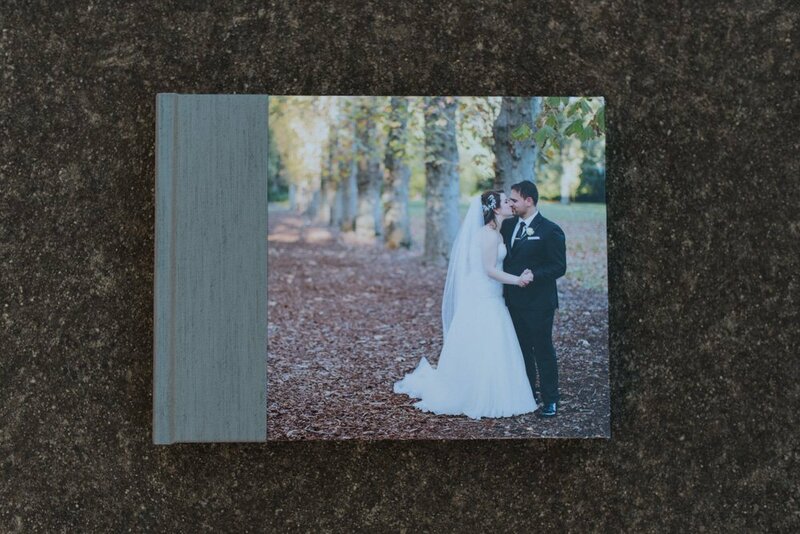 Today Im sharing a wedding album we created for a Melbourne couple’s wedding. 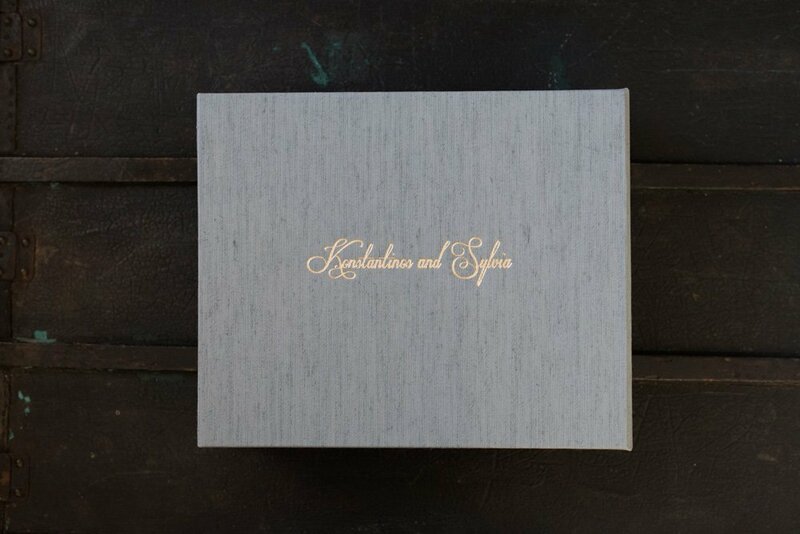 We here at The Coffee Table Book absolutely love this album. 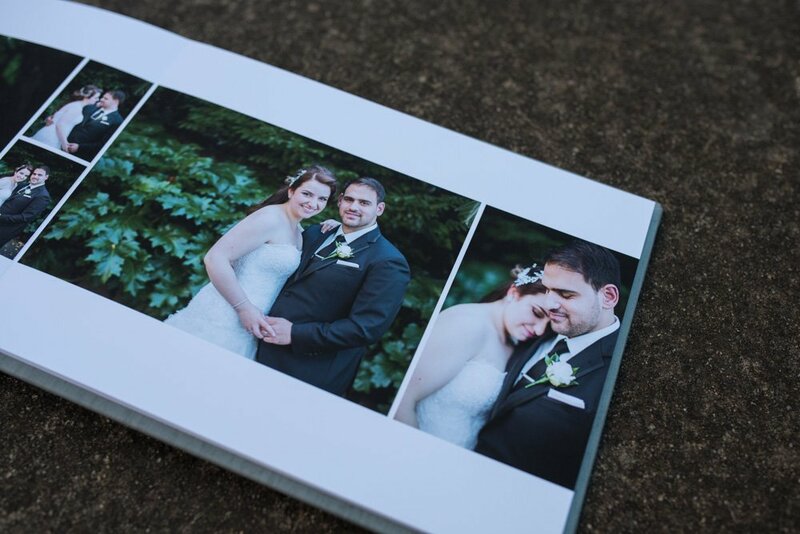 Apart from standing behind the beautiful quality albums we supply, we adore the beautiful wedding photography. 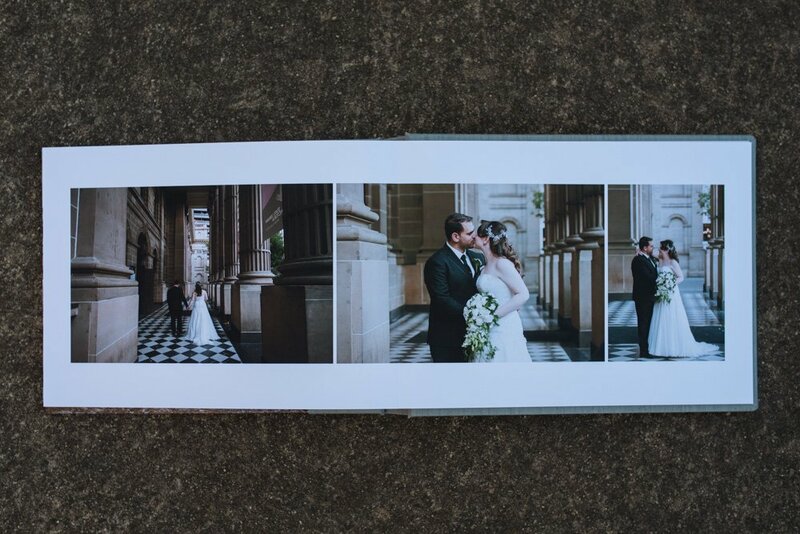 The couple hired a talented, awesome Melbourne wedding photographer to capture their special day which makes a huge difference to the finished album product. 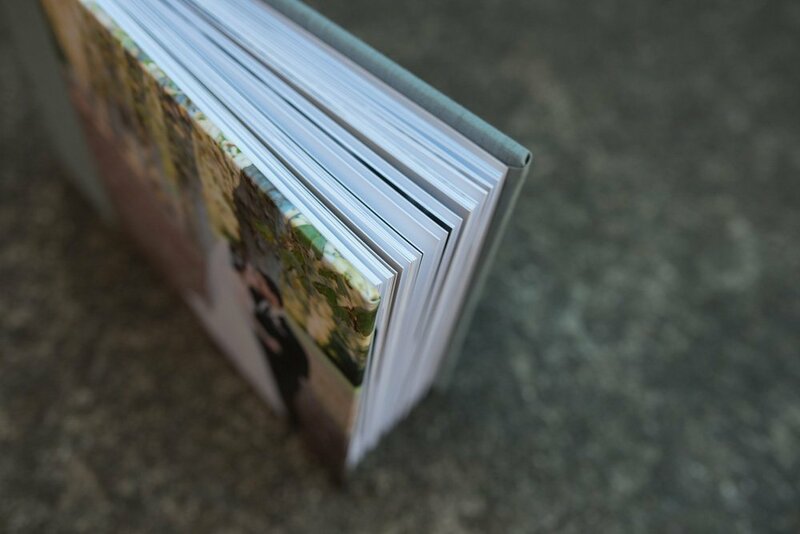 But rather than trying to explain with words, lets take a look at the album. 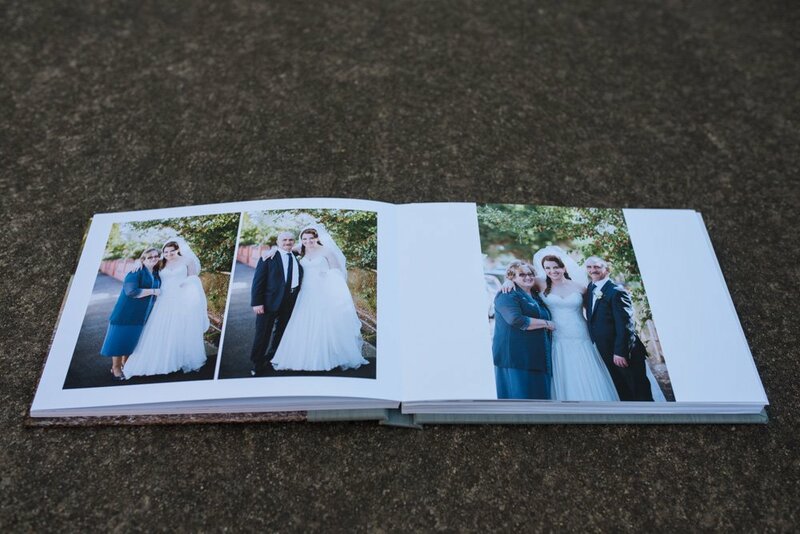 Most couples spend a large part of their wedding budget on professional photography, but then go and leave the memories sitting on a USB in the bottom of a draw. 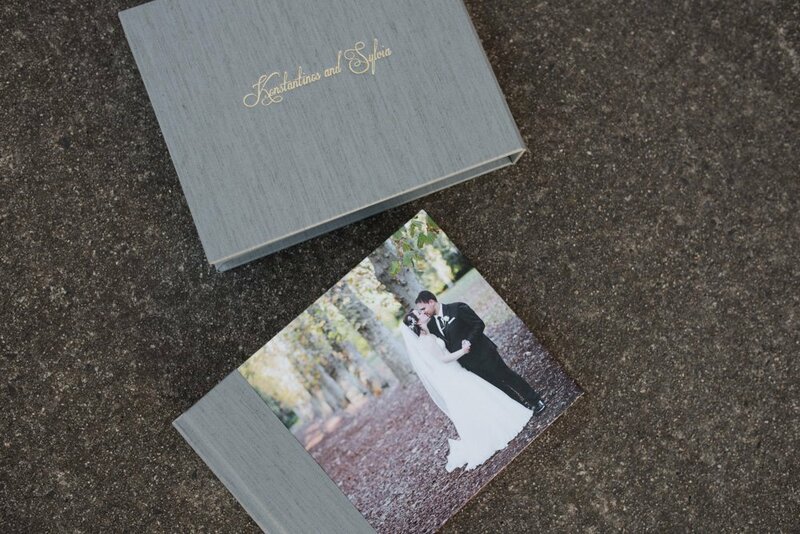 Chances are that USB is likely to get lost or simply fail when you need to access the photos. 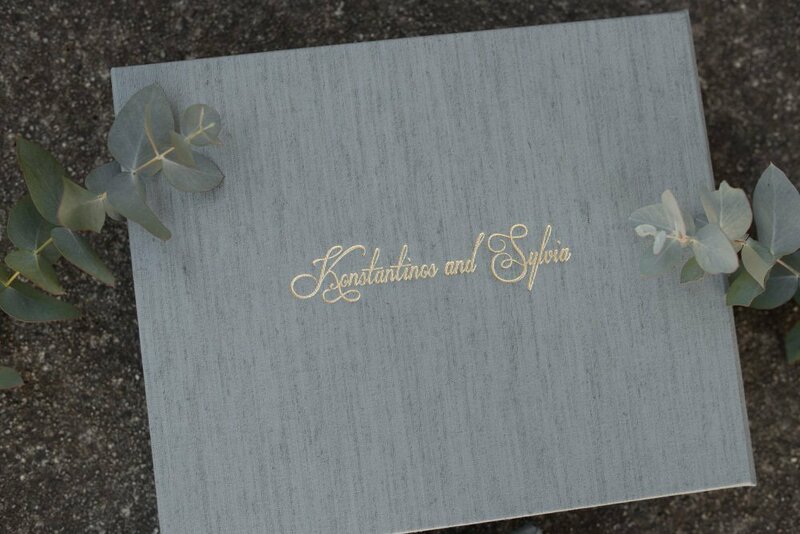 Then chances are they will most likely be lost forever. 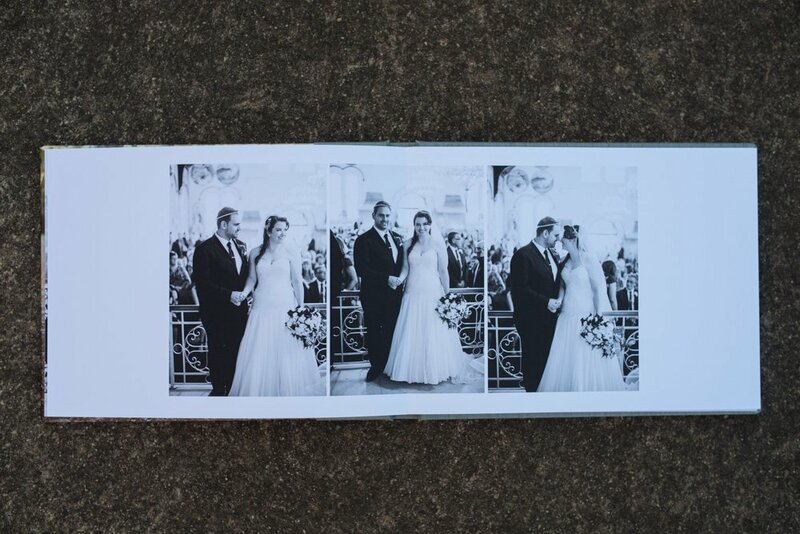 Printing your wedding photos is the best ways to back up your precious memories. 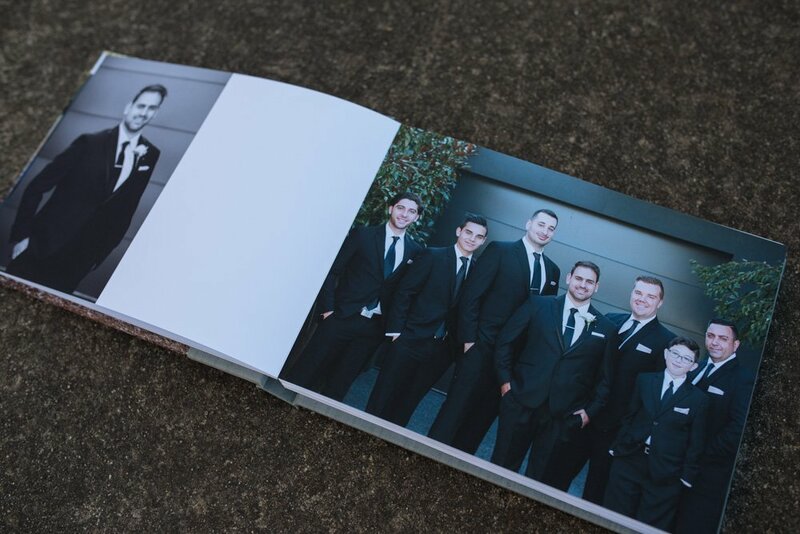 Printing your photos in a professional quality album is not only a way to backup your precious photos, but even better still, an album collates a series of individual photos in a storytelling manner. 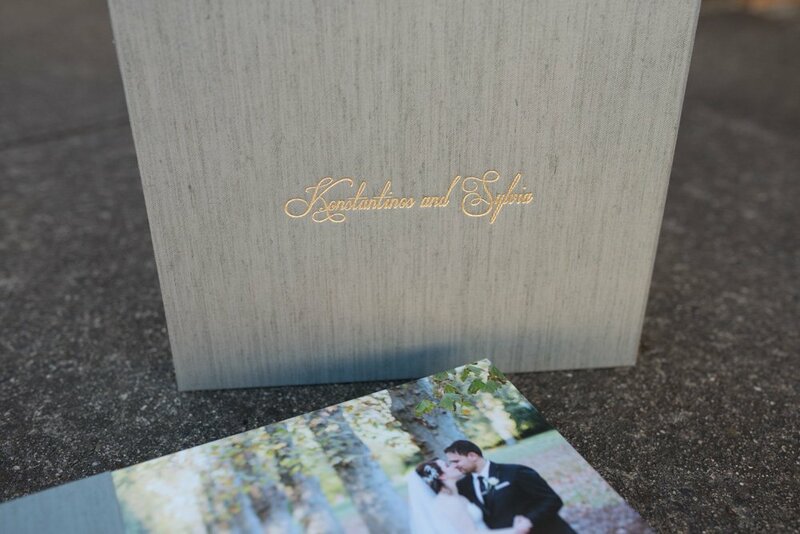 Our latest wedding album design for a beautiful Melbourne wedding. 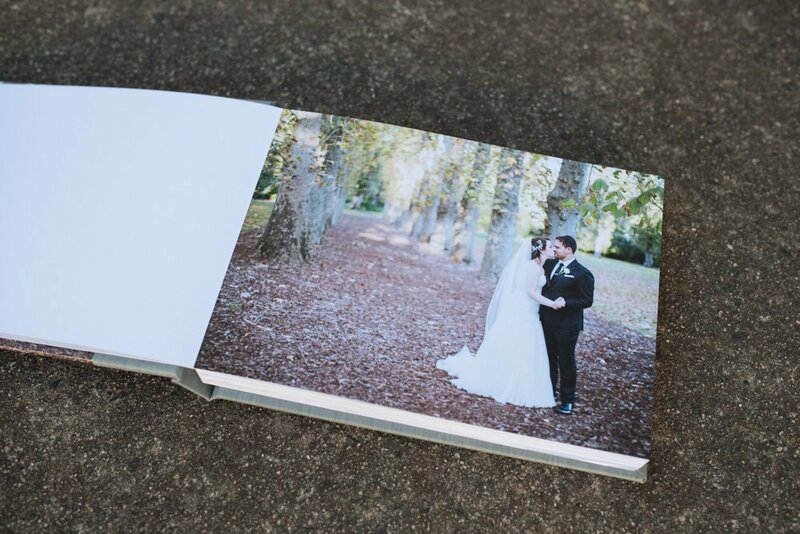 Below we tell our couples love story in a beautifully designed Fine Art Album. 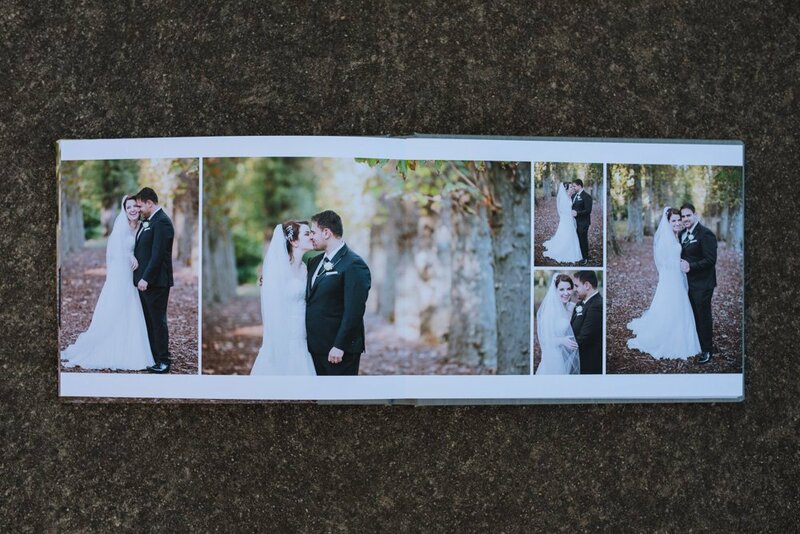 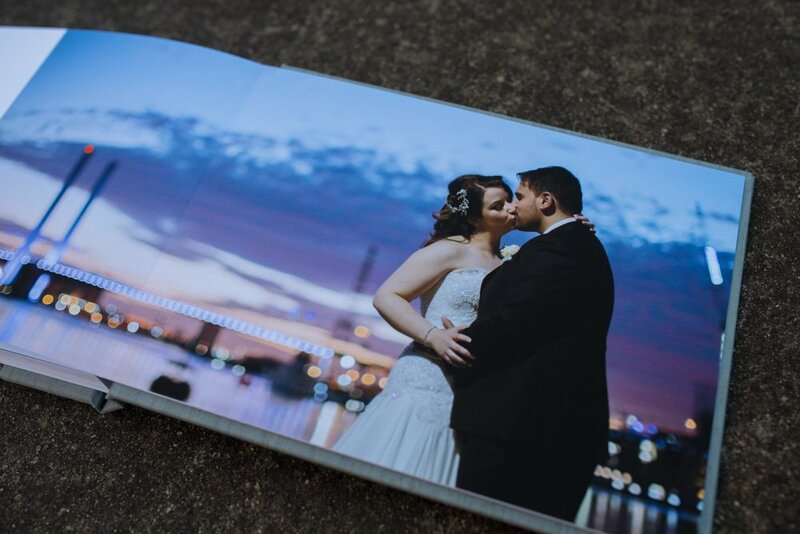 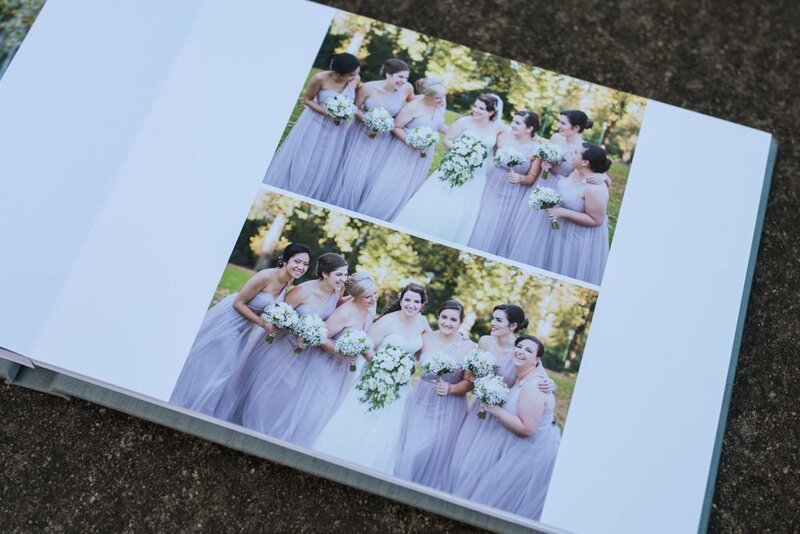 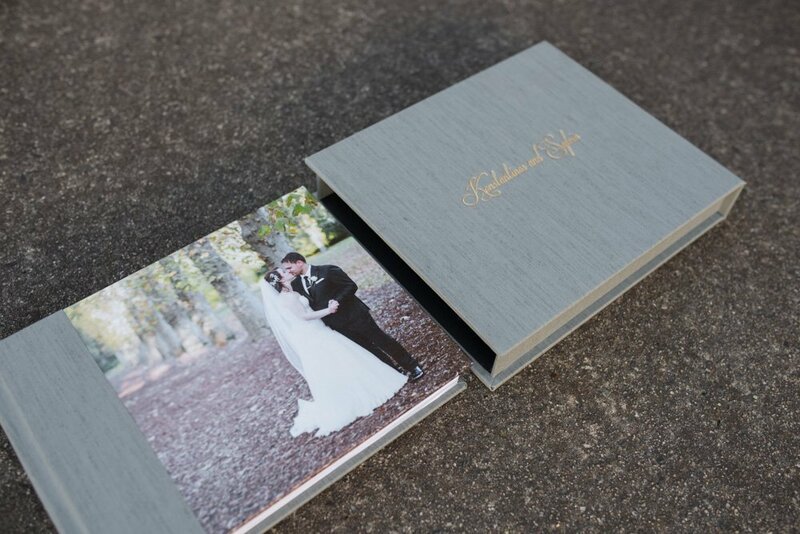 The wedding album we created for our couple is a 12×9 horizontal (landscape) fine art album. 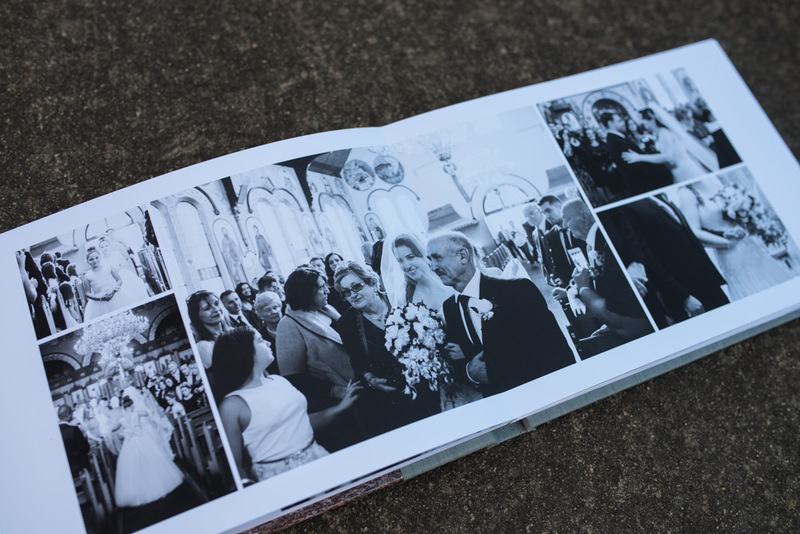 The page designs allow the images to breathe on the page, allowing each and every photo to take pride of place. 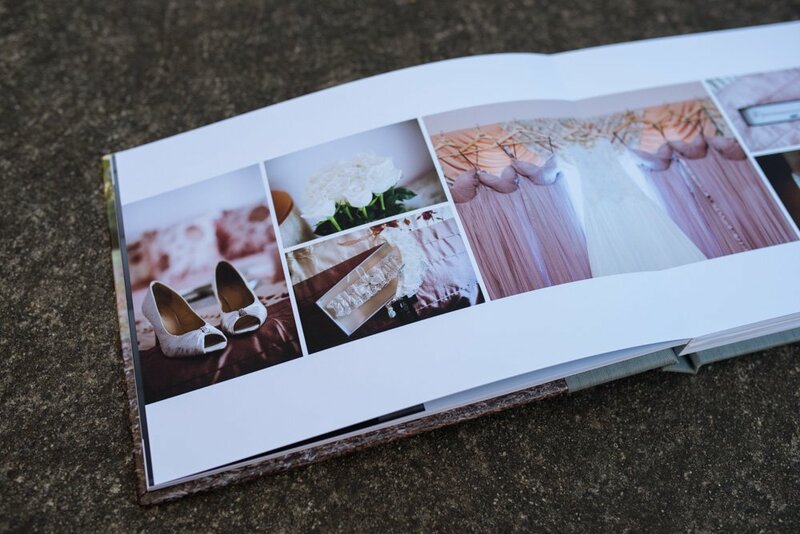 Each spread tells the story of a different part of the day to ensure the story is beautifully told. 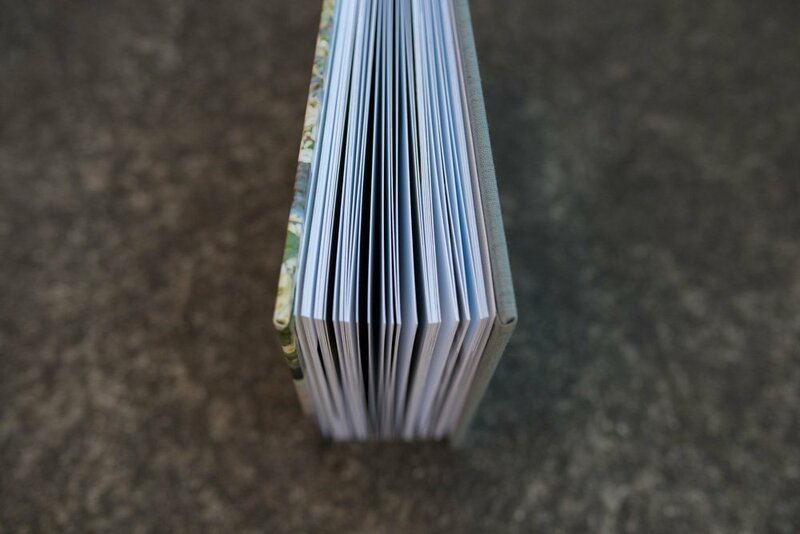 The story was told in 39 spreads ( 78 pages ). 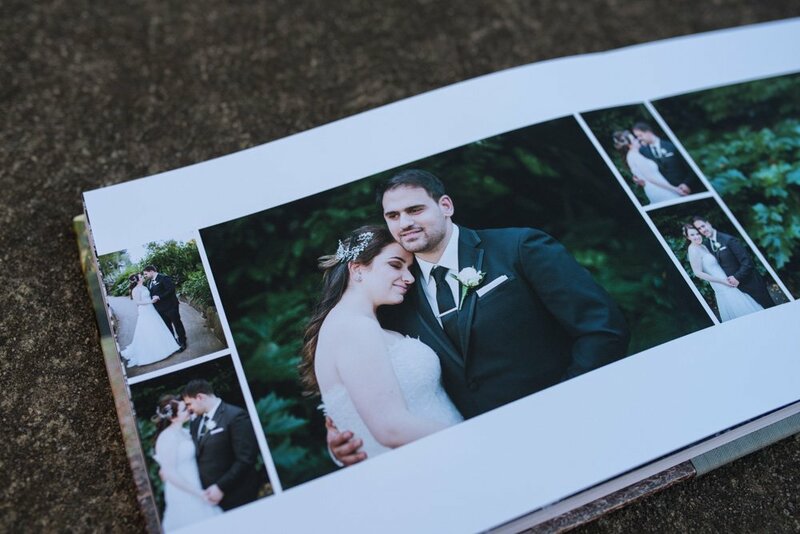 The album cover is the Image Cover option. 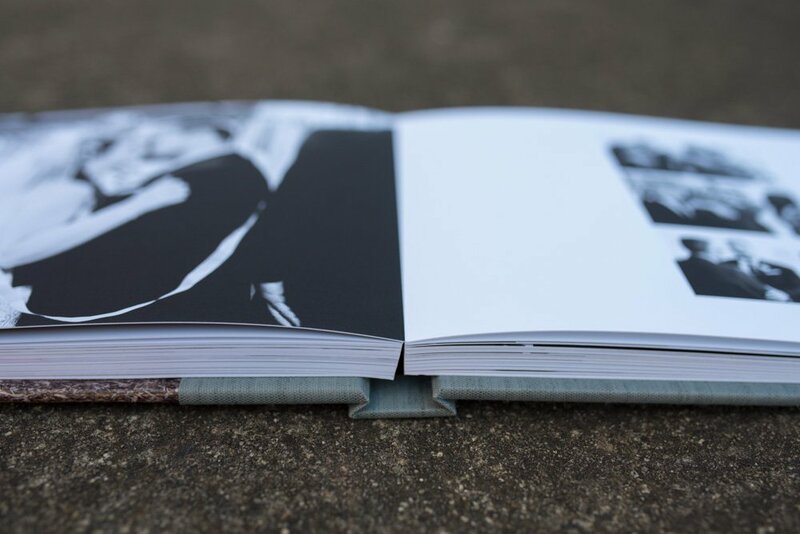 Where the image fills 3/4 of the front cover, with fabric wrapping around the spine and back cover. 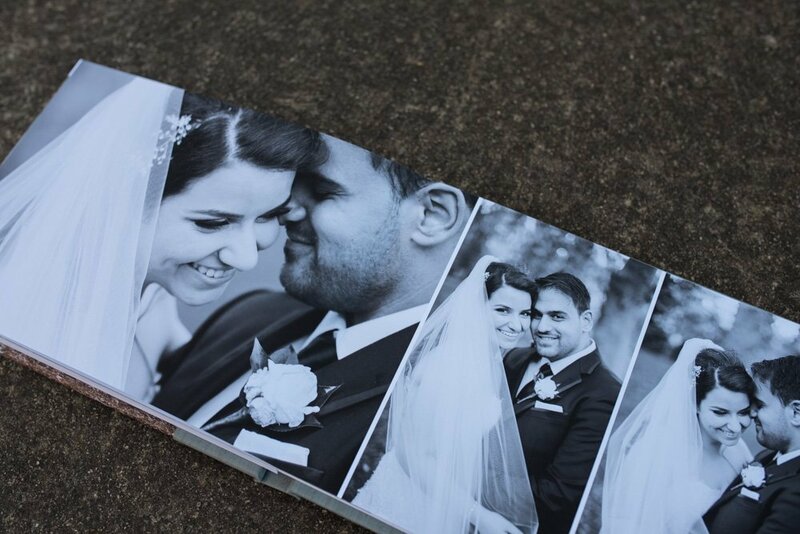 The chosen grey toned fabric colour ties in with the colour tones in the featured image. 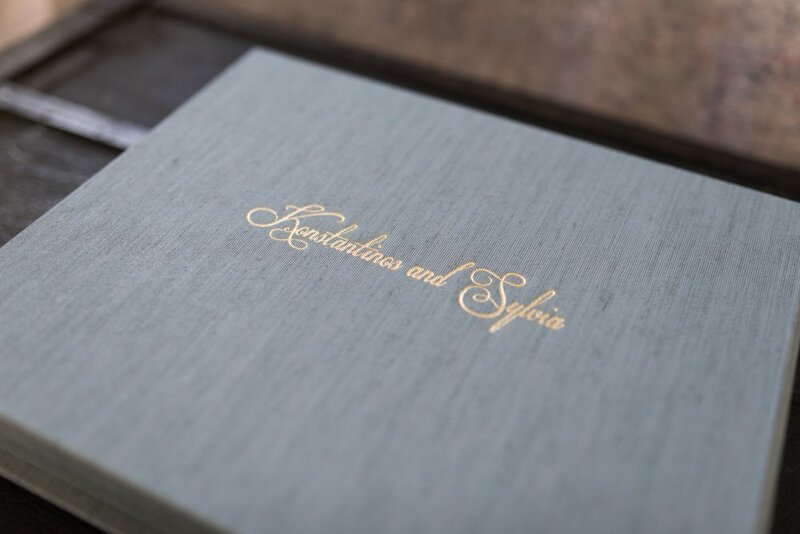 The same fabric has been used on the slipcase with personalised embossing, using the font from the couple’s wedding stationery, in a gold foil for a luxurious look. 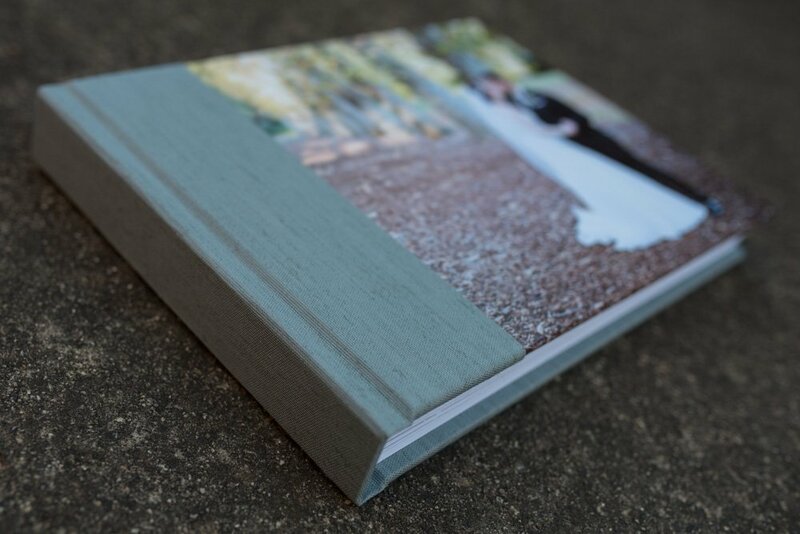 It’s important to choose a cover finish that ties into the wedding colours to be aesthetically pleasing to the eye and helps add to the wedding story. 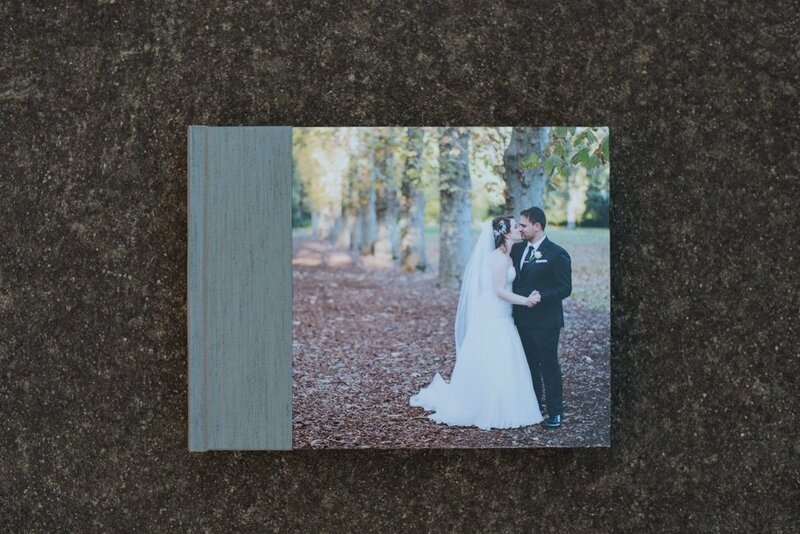 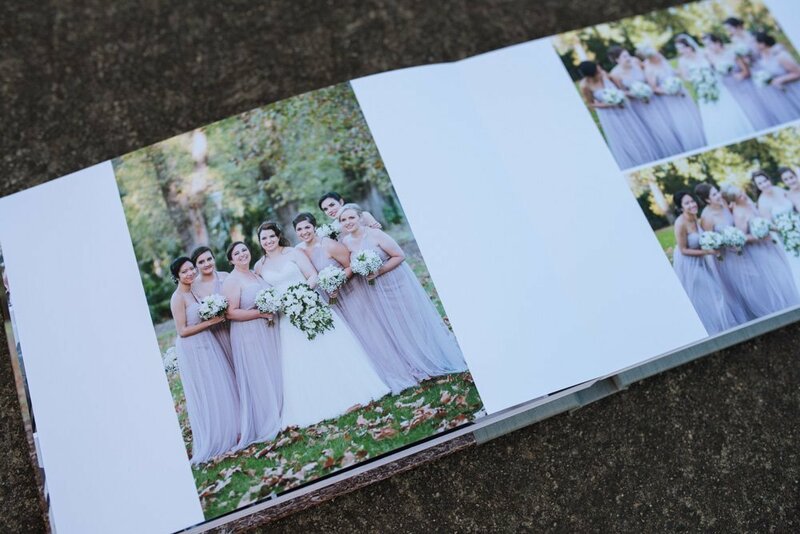 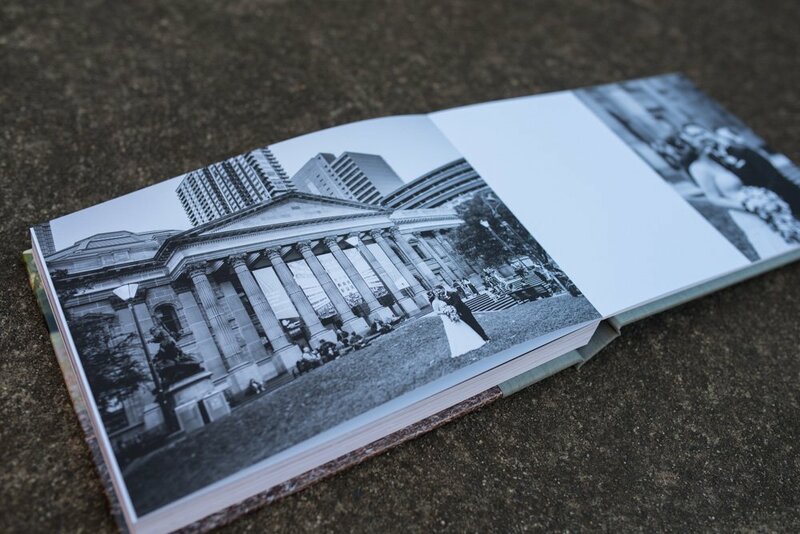 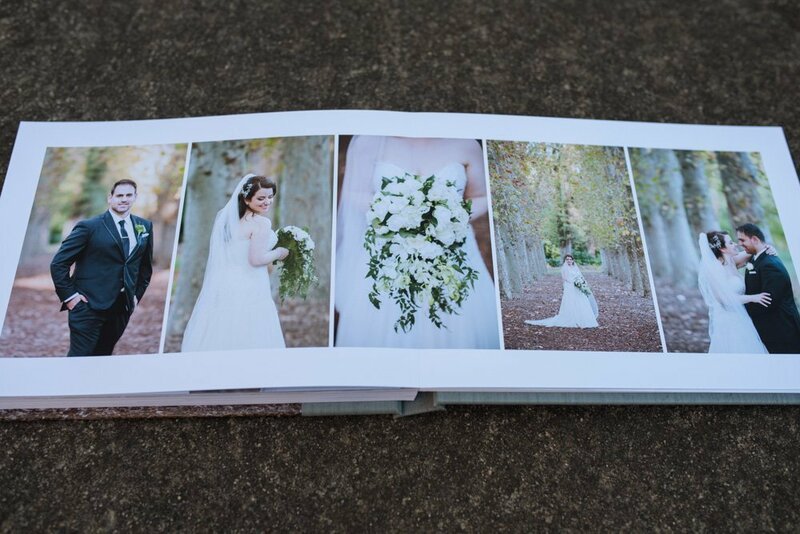 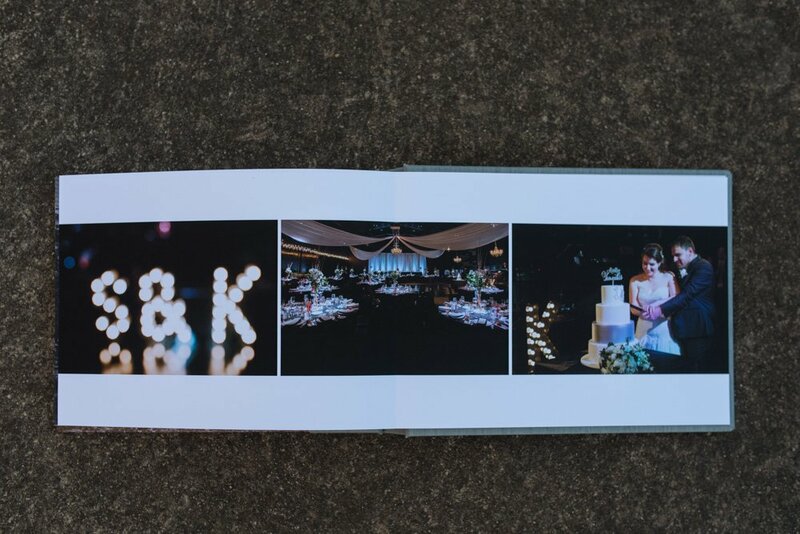 This classic Melbourne wedding album looks absolutely stunning, we didn’t want to part with it, but I can happily say it is well and truly on its way to the married couple. 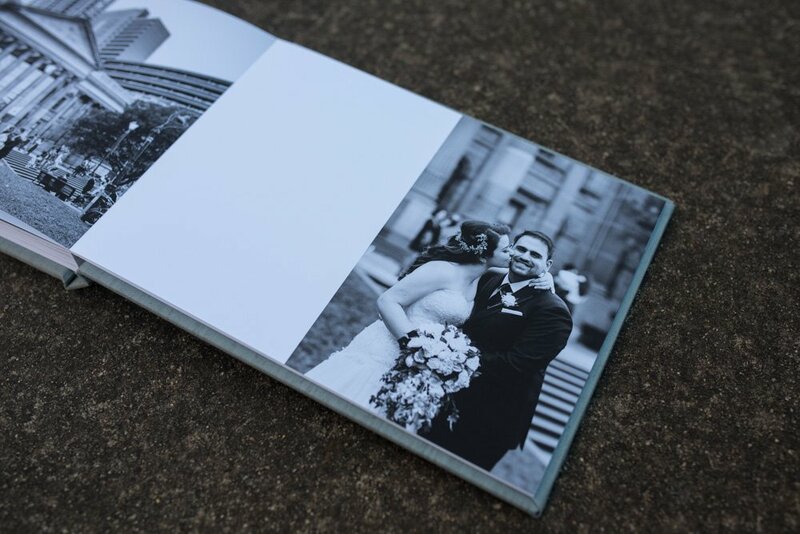 Printed on fine art matte paper. 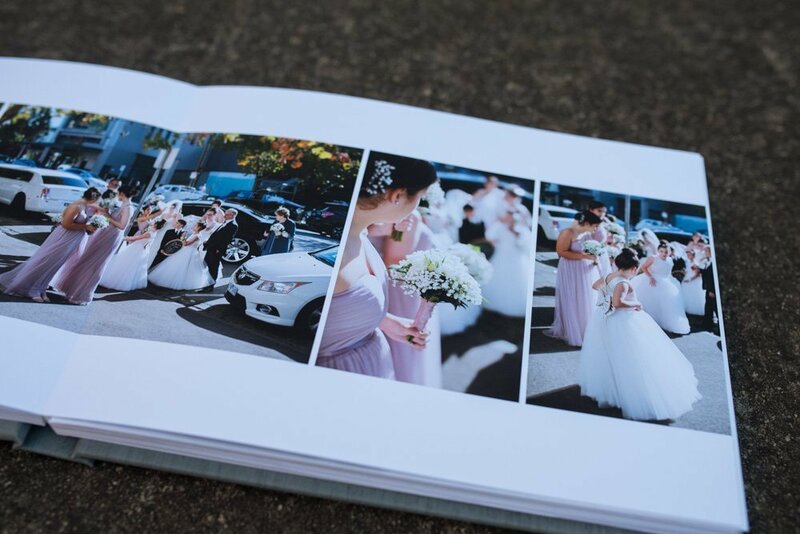 The fine art pages have a matte finish and are slightly thicker than your normal photo books, but not as thick as the traditional albums of the past. 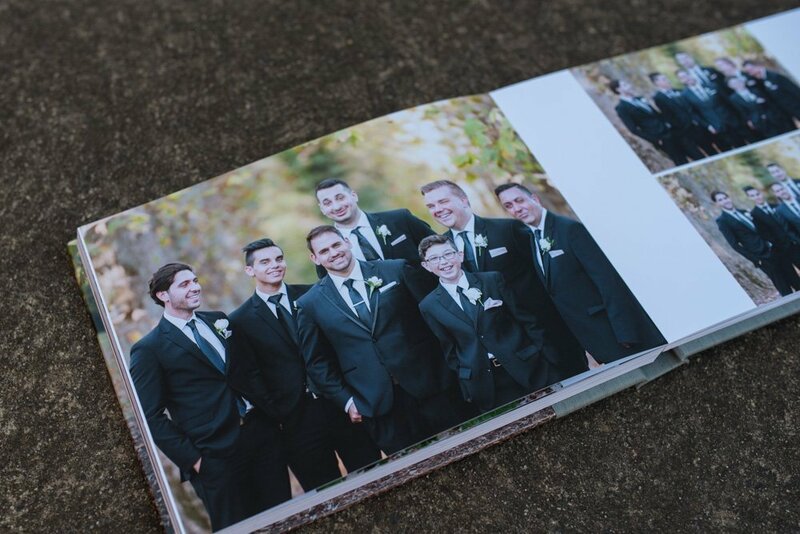 The slightly thicker pages are more durable but don’t make the album too heavy to easily hold. 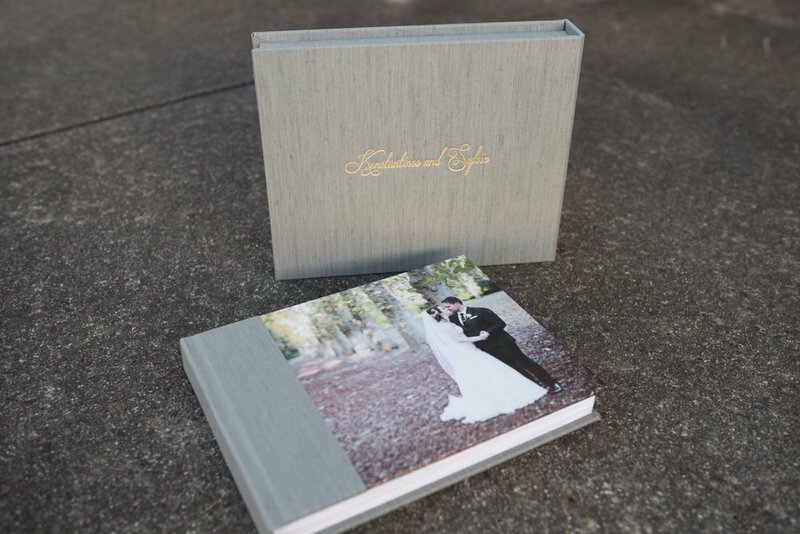 Image & Fabric Cover Wedding Album.